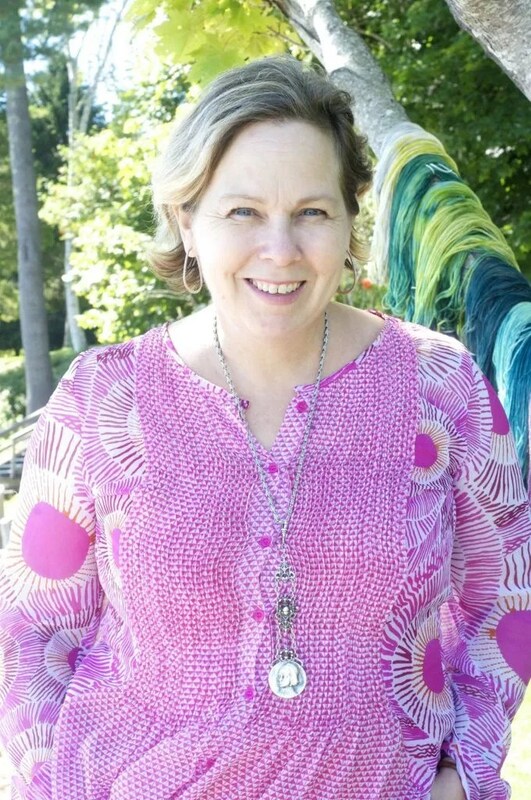 Knitting Through the Loops, Kirsten Kapur is a designer of some of the most popular shawls because of their beauty, was the guest today on the Yarn Thing podcast with Marly Bird. Kirsten is proud to say she came from a family of crafters. She went to art school and became part of the fashion industry as clothing designer for department store manufacturers, later with fabric designs. When her children came along, it was harder to continue that, but with the internet and blogs, things changed for her. The trepidation of posting a first pattern on the internet Kirsten says, which was prior to Ravelry being what it is now, is similar to posting a pattern today. Even with tech editors, mistakes in patterns happen, although chances of it happening are greatly reduced. Kirsten’s first publish pattern was in Knitty and received a positive response that surprised her. That happened because she was wearing it at an event when Amy Singer walked up behind her and whispered that she would publish it if Kirsten submitted it. Amazing! Marly asked a great question here about how does Kirsten design, and her answer was that it’s different for sweaters where she charts the designs for the multiple sizes before she knits it and with shawls that she designs while it’s on the needles. Shawls became her ‘THING’ for multiple reasons, that it only takes a skein or two which makes it a portable project that she takes with her everywhere and having one is a comfort when you find your self in a restaurant with good air-conditioning. The combination of stripes and lace attracts her too, because Kirsten doesn’t find herself as the ‘girlie’ type, her projects can be two-color. Her new Shawl Book One; Ten Best Loved Shawls from Through the Loops, is a collection of previously published patterns and she focused on the patterns being yarn store friendly, not so much the indie-dyed or gradient yarns that she loves. The photos are beautiful and were done by Gale Zucker, with her daughter and Gale’s niece among the models. Mystery Knit-a-longs or MKAL for Kirsten’s designs started with socks and have progressed to her shawls, which explains how popular her patterns have become. She has another one starting June first, that she just started posting about yesterday. Check out her Group in Ravelry for more information about participating. To catch a class with Kirsten Kapur (she’s teaching that beautiful shawl shown there on the cover) at Trillian Yarns in NJ this weekend, and visiting a couple places on the East Coast, you can find that at her website under Events. PS: Check out the cruise from NYC to the Caribbean! Kirsten Kapur can be followed at her website, Ravelry and Facebook. If you missed getting to hear this LIVE, it is still available as an archive: http://www.blogtalkradio.com/yarnthing/2015/05/07/knitting-through-the-loops-kirsten-kapur and in iTunes. I loved this podcast and it was great to learn more about Kristin. I immediately purchased the pattern for the MKAL shawl. I wonder if this one will incorporate the looped picot edge? Looped picot?? ?…Apparently, I have a lot to learn! Really enjoyed the show. Thanks! A wonderful interview with Kirsten Kapur. Thanks, Marly! I am knitting my very first shawl, and I would love to add some new stitches to my repertoire: looped picot sounds like a fun place to start! Thanks for the opportunity to win a copy of Kirsten’s new book! Loved today’s podcast, and would love to learn how to do a looped picot! Kirsten’s new book looks like it’s filled with beautiful patterns! Your interview this morning was great. I did the Cladonia in 2011 and enjoyed it very much, even the Looped Picots. I’m looking forward to the new shawl mystery. I have my pattern and ordered my yarn. Can’t wait for it to arrive. I am an experienced crocheter so I think I know what a picot must look like. However as a new knitter I will need to learn what a looped picot is and maybe how to make one or two! Loved this interview. I haven’t considered lace knitting because crochet does a good job of lace. BUT, I think you two have convinced me to give it a try. I’m excited to try the looped picot. I love your podcast. I have long been a fan of Kirsten’s blog and her shawls. I was so excited when I saw that she was your guest today. It is always fascinating to hear everyone’s life story and their experiences in the fiber world. The shawl on the cover of her new book is exquisite with the lace, stripes, and the looped picot binder. This is definitely making it into my queue for the pattern and my wish list for the book. Thank you for another great podcast. This was (of course) an awesome episode! I loved browsing through Kirsten’s shawl patterns on Ravelry while listening to the interview. The looped picot bind-off she mentioned sounds really interesting, and I’d love to try that out. Kirsten’s shawls are beautiful — I am making a tradition of knitting a shawl for my mom’s birthday each year, and looking through Kirsten’s patterns really gave me lots of great ideas of what to pick for this year. Thanks for the great interview! You draw out the best stories in people, Marly. 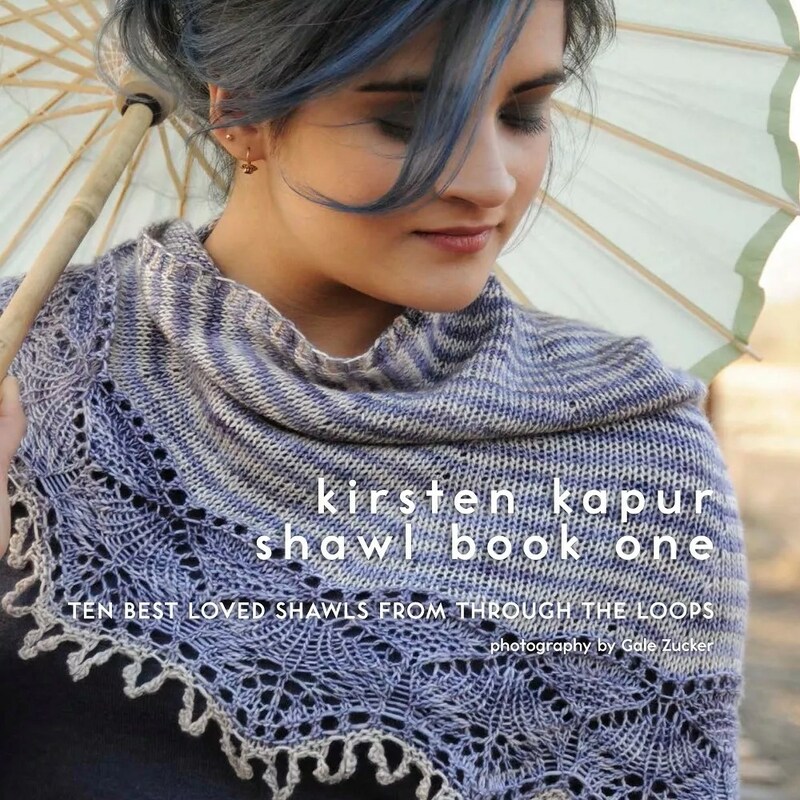 I loved hearing about how Kirsten designs and how the new shawl book came to be. I have yet to try the looped picot but I have all the faith the Kirsten has explained it well in her pattern. Thanks for another super podcast. I LOVE LOVE LOVE Kristen’s shawl patterns. I’d love to get her book and I plan on trying the looped picot bindoff. The photos in the book are amazing, especially the looped picot looks impressive and intriguing… I’d love to try it out by knitting Cladonia during the Summer. Kirsten’s shawl patterns are beautiful! I would love to learn how to create the looped picot edge. I really enjoyed the podcast today with Kirsten Kapur! Everyone of her designs are gorgeous! I think the looped picot edging is a stunning trait in the design of her shawls. I really enjoyed her story and how she stepped into the designing world. Marly, I love your show so much!! By interviewing these designers and having them tell their story gives me hope and inspiration to work hard and to keep trying my hand at designing! New techniques keep things fresh for us seasoned knitters. Thank you Kirsten, for your beautiful designs. I look forward to trying my hand at the looped picot edge! Thanks for the informative show – would like to learn to kit the looped picot edge! Hmmm. Loops, I know. Picot, I know. But looped picot? I’m as intrigued by that as I was by Kirsten’s story! I’ve never done a looped picot edge. The MKAL might be a great opportunity to learn something new. Your show is wonderful! I look forward to seeing that notice that another one has arrived for me to listen to. I love Kirsten’s patterns and have never done a looped picot edge. Great podcast! Great pod cast thank you! Looped Pico sounds fun. Really enjoyed the podcast. A looped picot sounds very interesting and something I would like to try. Thanks! Love listening to you, would love to learn more about looped picot. Love Kirsten’s patterns. I’ve never heard of looped picot, but picot is very beautiful, so I’m sure it’s amazing! I have tried a picot edge, but not a looped picot edge…very intriguing! All the fad now is looped picot edgings. I am taking a class on this technique in a couple of weeks and I can’t wait. The podcast with Kirsten was wonderful. Thanks for a great interview with her. I ordered the digital version of Kirsten’s book when I saw Cladonia on the cover. The yarn I ordered to knit it arrived yesterday and I’m itching to cast on. The looped picot edge is wonderful. I can’t wait to learn how to do it. I’ve bought the 2015 Mystery shawl too. Now to select the perfect two yarns. Thanks for the great interview with Kirsten. She’s one of my favorite designers! I loved doing the looped picot on the Cladonia shawl! So…. Beautiful! This was my first time listening to a podcast. I also signed up for the mystery shawl KAL, which will also be a first for me! This is just so much fun! Great fun to hear the podcast! Wonderful interview! Another thing to try out is looped picot. Sounds very interesting. Nice podcast. I enjoyed learning about Kirsten. I hadn’t heard of her before, but I would be interested in learning the looped picot bind-off. I haven’t heard of a looped picot before. This is only one of the things about which I learned while listening to Kirsten. Thanks for a great show! Hearing Kirsten talk about taking that leap of faith posting her first pattern was something I could relate to. I published my first pattern just a few months ago and currently working on a second design. I am signed up for the mystery shawl KAL. I just did a picot cast-on for a shawl I’m knitting. Cladonia is on my list of shawls to knit, and the looped picot bind-off will expand my repertoire of picot techniques. Cannot wait to knit Cladonia and to see what the mystery shawl will be! It was really nice listening to Kirsten Kapur today. I’ve been listening to the podcast on my morning walks. I’m a little intimidated, yet inspired, by her patterns. I don’t have time for a KAL, but I’m really into shawls right now. I don’t know how a looped picot will fit into my repertoire but I am interested in finding out about it. Great show! It was so nice to learn more about the amazing Kirsten and the looped picot finish on the Caledonia Shawl sound fun!!! I have heard/seen Kirsten’s name and designs, but loved learning about her! I live near one of the places she will be teaching a class and will check it out. Maybe I will learn the looped picot finish on the Caledonia Shawl! love the patterns, need to see what the looped picot finish is all about. Great show!! I loved hearing about Kirsten’s designs! She has really beautiful designs! I have not tried a looped picot bind off before. I have been bitten by the shawl bug too! It’s all those great designs out there that are just too tempting. You and your “Looped Picot” edgings are just too hard to resist Kirsten!